Excellent temperament, Great with Kids, Great with other dogs, SPAYED, shots up to Date except needs Rabies. She is a Retired CH Show Dog, Recently Spayed and Now Looking to Put Her in a More Calm Home Prefer With Seniors Or Quiet Home Although She does love attention from Kids. 500 For Her No Papers will be Given She is a Miniature French bulldog Not Standard Size She weighs about 13-15 ibs Currently. 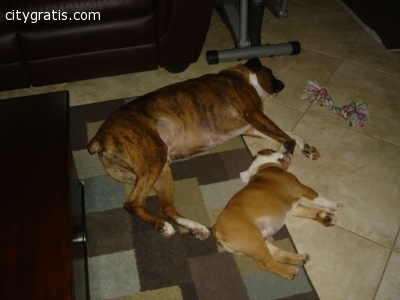 -MALE Purebred English Bulldog Puppies. He is a 3 Months Old, Very friendly with People loves attention, No health problems But have a Flea Allergy and Will Break out if he gets Bitten. The Bad; He DOES GET ALONG WITH OTHER MALE DOGS, and PUPPIES TOO. He Can Go to the Dog Park just Fine but does Not like having dogs in his face,He Turned aggressive After 2 Large Labs Attacked Him Once And Had to Be rushed to the Vet. He is Friendly in public and won't just run up to a dog and attack them but does need social work. He LOVES KIDS, He knows basic Commands, He is Not neutered But Will not be re homed To a Breeder, We Were going to Show Him So hence Why He isn't Neutered Yet. He is 500 Good Homes Only and Serious Inquires who are seriously Looking to Adopt!